Regular courses in Greek Language are mainly designed for foreign students who permanently live on Crete or spend here long periods of time and they want to learn Greek. Lessons are held twice a week so that students and particularly adult ones can have free time between lessons. Speed of teaching varies from group to group depending on the class while the length of these courses is open-ended. However, the suggested duration of attendance can be no less than two months if students really want to see progress. Before registering each student is interviewed and placed into a group of his level (Beginners, Elementary, Intermediate, Advanced and Proficiency). 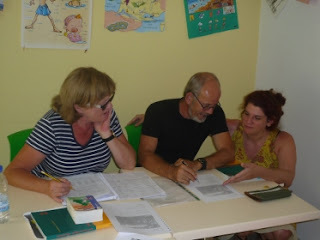 During the lessons students are always welcome to discuss their progress or weaknesses with their teacher and all together decide on the specific language points they want to focus on. Whatever the level of the course, emphasis is always given on both linguistic features (grammar, vocabulary, syntax etc) and practical use of the language. Students are always encouraged to speak and build confidence at least in every day conversations. Groups are strictly kept within 2 to 7 students.